My 10 most popular recipes! This is one of my first recipes! I'm so happy to see it's become one of my most shared still to this day! This bread is pretty close to the real thing when it comes to the texture. It has a nice hard crust and a moist inside. I must tell you though that this bread tastes a lot more than traditional bread. When you're creating recipes for a living you find out that there are two kinds of recipes. 1. The kind that you only make once or twice for the job, it looks super fancy and creative and you know that people will share it. 2. The kind that usually doesn't look like much but you make it all the time! You use it in your daily life and one day you just spontaneously share it because it's sooo darn good! This is that kind of recipe! More finger food to the people! I wasn't surprised to see that this recipe instantly became very popular. I mean, hey, just look at it! So much color and positive vibration! Easy to make, beautiful to watch and delicious to eat! A super simple raw cake with vanilla and chocolate, you can't really go wrong with this one! 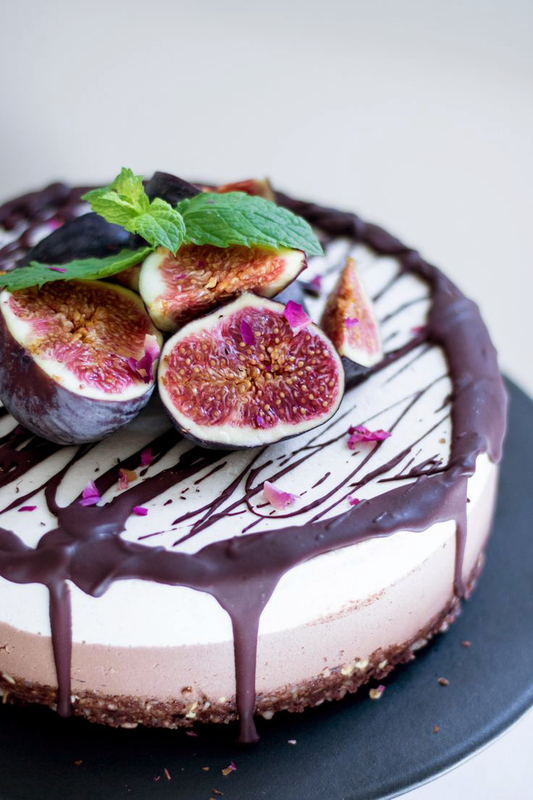 The figs are stunningly beautiful to watch but not always in season... Don't worry, this cake will be just as big of a success with any kinds of fruit on top! Salty caramel between a crispy vanilla crust layer and a soft decadent topping of raw chocolate ganache! Caramel bites were the first ever (advanced) raw desserts I tried in my life! No wonder I fell in love straight away... I was living in Sydney and went to a very hip place called Earth to Table in Bondi! I was overwhelmed by their cake stand and I literally took me an hour to decide what to order. Even though I had tried raw balls before, the caramel bites were really some next level ****! Not everyone is a huge fan of chia puddings. But if you ever want to convince someone that chia puddings are actually worthy of the hype, let them try this one! No need for real key limes, regular limes will work just as fine! This chia pudding tastes like a dessert without having too much sugar. Creamy, tart and sweet with that delicious lime flavor. It's perfect for breakfast or as a small afternoon snack. This is my third most popular recipe and I'm so happy about it! A buttery pecan oat crust, cardamom vanilla filling and a sweet cinnamon swirl topped with melted creamed coconut and cinnamon candied pecans. Aren't you drooling yet? You know you've made something great when copy cats show up all over town trying to claim your creation! Haha, and you know what? I'm glad more people can enjoy them! Sometimes it bothers me that people don't give others credit for stuff that they made. It's been a good lesson to experience that, and just to work on my ego and say; in the end it doesn't really matter who came up with what. This is after all a very Swedish classic and I'm just happy that people who'd like to eat raw, vegan and gluten free can experience it too! Speaking of giving credit... This cake is all inspired by the king of swirl-cakes Mr. Stephen McCarty! I remember seeing his cakes on Instagram a few years back and I was completely mesmerized! The cakes he make are super vibrant and almost psychedelic. I've made many swirl cakes inspired by his designs and their always have a very high wow factor! People go a little bit crazy when they see them. :P No wonder that this has become my most popular and most shared post since I started the blog! It's been re-pinned over 50 000 times on Pinterest! Aspiring food bloggers & food lovers! This course is for anyone who has a passion for food and would like to improve their photography skills! All the basics of Food Photography. It is comprehensive yet easy to learn! I many times struggled with a creative slowdown or just a lack of motivation. Read more to see what I do to handle it and what brings me new inspiration.